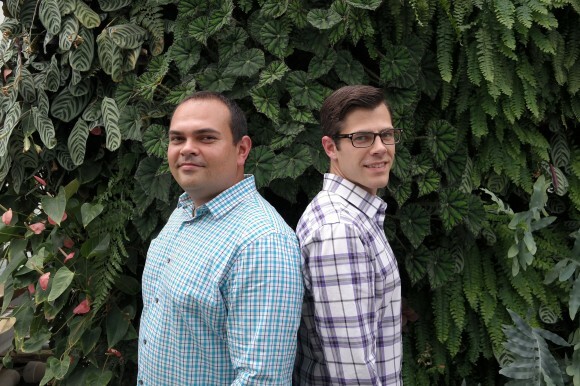 Share the post "Alumni Story: Two Recent Grads Take ‘Growing Up’ to New Heights"
The concept of living walls – also called vertical gardens – isn’t entirely new, but Michael Coraggio (Cook ’06) and Ryan Burrows (GSNB ’13) have turned it into an innovative business that promotes beauty and sustainability with practical and environmentally sound applications. First “invented” in the 1930s, a living wall turns an impervious vertical surface into an attractive and ecologically beneficial space. This architectural approach has surged in popularity in recent years, especially in urban settings with scarce green areas, office buildings and other structures that beg for aesthetic improvement. Their business, EcoWalls®, takes a soil-less, hydroponic approach to growing and maintaining a vertical garden, rather than using soil or other media. The advantage is that a non-soil medium allows for more consistent results and, unlike soil, does not break down or decay. This reduces maintenance and replacement costs. But hydroponic growing takes water, and the last thing these two wanted to do was produce a seemingly environmentally sensitive product that turned out to be an insensitive water guzzler. So back to the drawing board they went, and with a bit of space to use in the Floriculture Greenhouse on the G. H. Cook Campus, they were able to experiment for eight months to develop the ideal approach. To this day, Michael and Ryan are grateful to Nicki Graf (Cook ’77), supervisor of the greenhouse, who was a “great mentor and friend” from Michael’s days as a landscape architecture student through his successful living wall breakthrough. Ryan, who earned his master’s degree in ecology with the Department of Ecology, Evolution and Natural Resources, has an interest in environmental toxicology. It was his idea to design a living wall with an aquaponics system, using fish to create the nutrients that feed the plants which, in turn, purify the water and return it to the fish. Signage at the Rutgers EcoComplex greenhouse. Now their product line includes a Chef’s Wall Garden™, a Living Classroom, and a Planter System. Some of these also can be adapted as mobile units. Michael, founding principal of EcoWalls, didn’t plan to get into plants, or even business. After growing up in Flemington, NJ, he enrolled in Colorado State University as a cell biology major, “with the intention of pursuing exotic veterinary medicine. I did well academically at CSU and had a great time at that college, but I guess you don’t know what you’re missing until it’s gone. After getting homesick and missing my New Jersey roots, I transferred to Rutgers.” His decision went over well with his Rutgers alum father, Michael J. Coraggio (RC ‘80). When he arrived at the Cook Campus, young Michael decided to take a landscape architecture elective. He met the late Professor Roy DeBoer (GSNB ’59), and that switched his thinking “into a passion for habitat design, landscape immersion and conservation,” he said. 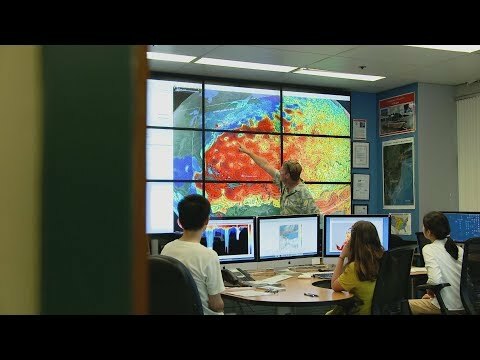 Their work is on display in several locations at Rutgers, such as at the Bloustein School, at sites on the School of Environmental and Biological Sciences’ Cook Campus, and at the Rutgers EcoComplex, where EcoWalls’ offices are located. They are scheduled to install one of their largest living walls yet in the new home of the New Jersey Institute for Food, Nutrition and Health, now under construction on the Cook Campus. The living wall will be 39 feet by 33 feet, “which will be part of the building core design, and students will ‘travel up the EcoWall’ as they walk from floor to floor within the building,” Michael noted. Michael gives credit for his success to many individuals in his life, but he particularly cites Executive Dean Bob Goodman as a “major positive influence. He was one of our first customers and has been immensely helpful to us for business development advice and for steering us to some major contacts in the industry. “It is a wonderful experience to be part of the Rutgers family,” he concludes. 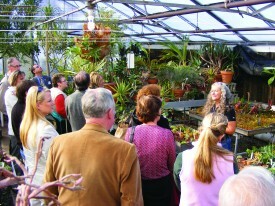 Rutgers Research Farm Supervisor Nicki Graf leads a Floriculture Greenhouse tour. Later, when Michael was working out the kinks in his hydroponically-based vertical garden concept, he turned once again to Nicki. 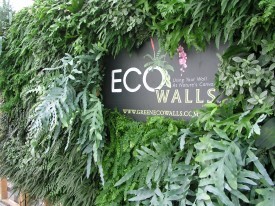 As he described it: “Many of the vertical garden systems on the market used a thin layer of felts. These felts distribute water to the plants’ roots but can dry out rapidly. They can require more frequent watering than conventional landscapes, turning a seemingly environmentally beneficial approach into a water guzzler. Philosophically, it was important to us that living walls became a viable solution to urban landscape design and not just a short-term trend. “Ryan and I went back to Nicki at the Floriculture Greenhouse and asked if she would be willing to provide us with some space for material testing. After we explained our crazy idea, she was kind enough to accommodate our request. After about eight months of researching inorganic materials for growing plants, our first prototype was installed in the main entrance to the Floriculture Greenhouse. It remains there to this day,” he said. Nicki, who is supervisor of the Floriculture Greenhouse, is actively involved in events and programs on the Cook Campus. One of the highlights of her year is the annual poinsettia competition at which time the greenhouse is filled end to end with poinsettia of all colors and designs. Then, when the judging is over, they go on sale to the Rutgers and surrounding community, usually the week before the winter break begins. Be sure to look for Nicki next December or anytime when you visit the greenhouse.